Surabaya is one of the most important cities in the history of Indonesia. In the era after independence and now, Surabaya transformed into a metropolitan city in Indonesia. This city became one of the business centers in Indonesia. For those who like to have vacation, Surabaya could be a choice for the interesting destination. There are many exciting places in Surabaya waiting to be explored. Moreover, there are some fascinating facts about Surabaya that you should know. Read those following paragraph to get it. The first fact you are going to know is Surabaya is the second largest city in Indonesia after Jakarta. It has an area of approximately 374.8 km2 (144.7 mil²) and has a population of more than 3,123,914 inhabitants. It is not such a surprised since Surabaya is the capital city the province of East Java. The major population of the Surabaya is Javanese tribe, some are migrants from various regions who live settled, and some others are nomads. Used as very important military defense for Indonesia. Surabaya Zoo is the largest inner city zoo in Southeast Asia. Built on 31 August 1916 under the name Soerabaiasche Planten-en Dierentuin (Botanical Gardens and Animals Surabaya), it is the result of the services from a journalist named H.F.K. Kommer whose hobby is collecting animals. In the early days of its establishment, this zoo even became the pride of Queen Wilhelmina. This area until now became one of the icons of Surabaya. Both places have very different elements. Chinatown area which is most populated by Chinese people, is popular with the name of Kya Kya. Along the street of Kya Kya established some stalls that sell a variety of Chinese cuisine, food typical of Surabaya, and other foods. The word kya-kya is taken from one of the Chinese dialect which means the taking a walk. It is contrast to the Kampung Arab that is located not so far with the Kya-kya. There you will feel the atmosphere of Middle Eastern style. This place became a tourist destination that many tourists visit, especially during Ramadan. Although those places located in close distance, but all this time, these two places just get along well. That’s because Surabaya upholds the element of cultural diversity. No wonder not Surabaya often won environmental awards from the President. Surabaya is known to as its shady and green atmosphere compared to other cities. Some of the names of parks that you have to know are Taman Bungkul, Flora Park, Park of Achievement, Apsari Park, Taman Pelangi. And the most unique ever is the existence of Elderly Park in Surabaya. This park is functioned as an alternative park for the elderly of Surabaya. The area which has approximately 2000 m2 width set up into a beautiful garden. It looks so stunning with the variety of beautiful plants and flowers. This city has at least 33 malls that spread to all the area of Surabaya. No wonder if Surabaya city also become the central economy in Indonesia. You can count by yourself how many café, restaurants, hotels, the entertainment area that established. Therefore while visiting Surabaya you don’t need to worry to look for the place for hang out. 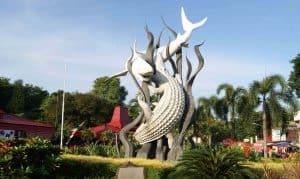 Taman Bungkul is a beautiful park located in the heart of Surabaya. This park was awarded as one of the most optimal parks according to the United Nations. This park is worthy of the award because it has a social function, culture, recreation, and education. In addition, the park is also equipped with various means of support, such as jogging track, children’s playground, wireless Internet access, amphitheater, and skateboarding arena. Coming to this place would never be bored since there would be many activities to do. Surabaya won the Socrates Awards in the category of City of The Future in April 2014. The award, initiated by Europe Business Assembly, considers Surabaya has a good city management. The people accepted the award very well. Then Socrates Cup was paraded around the city of Surabaya.Ms. Risma as the mayor of Surabaya brought the trophy proudly in her own hands. Japan Housing Associations-IYSH Matsushita Award (1988), UNEP Award (1990), UNCED Local Government Program (1992), and The World Habitat Award (1992) are a series of international awards for villages in Surabaya. This proves that cities and villages can be built harmoniously without any gaps. Thus, Surabaya can be a modern city, but hold on to its culture. Many important figures come from East Java. This city does not cease born the leading generation with a myriad of achievements. They come from various professions, such as: scholars, politicians, athletes to celebrities. Some of famous religious figure are Hasyim Muzadi, Mustofa Bisri and Ahmad Sahal. For the celebrities are Ahmad Dhani, Joshua, and the phenomenal Dangdut singer, Inul Daratista. And for the legend artists are Sudjiwo Tejo and Didi Petet. All of them were born and spent their childhood in Surabaya. Surabay is led by a mayor woman names Tri Rismaharini. The mayor is one of three regional heads from Indonesia in 2012 which is included in the list of nominations of the World Mayor Prize by the City Mayors Foundation. She is also the tough leader with her ambitious idea to change Surabaya into beautiful city. Fortunately, Surabaya has the great woman that lead the city very well. Those are the thirteen facts of Surabaya that you should know. Once you visit Surabaya, don’t forget to taste some Traditional Food of Java. You know that Surabaya is identically with Javanese things. Moreover, it is located not so far from Bali, you could reach Bali two hours only from Surabaya.